Compare air fryer brands Philips, Kmart, Tefal and Kambrook on cooking performance, value for money, design, ease of use, ease of cleaning, functions & features and overall customer satisfaction with Canstar Blue’s 2019 review & ratings. Philips has fried the competition in Canstar Blue’s inaugural air fryer ratings, scoring five-star reviews on cooking performance, value for money, design, ease of use, functions & features and overall customer satisfaction. Maintaining a healthy diet isn’t easy when you also enjoy snack foods like chips, which are generally high in saturated fat. 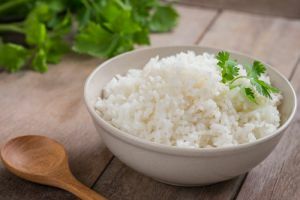 For whatever reason, most of our favourite foods also happen to be bad for us, so wouldn’t it be great if there was a way of cooking our most-loved foods without having to worry about how unhealthy they are? Step forward the humble air fryer. It’s not a miracle appliance that suddenly makes all those fatty foods good for you, but it will help you eat healthier versions of your favourite guilty-pleasures – and you’ll know exactly what’s gone into them. 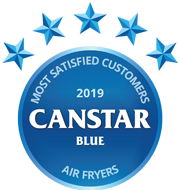 So, to find out who serves up the best finger lickin’ chips, veggies, or anything else you can put in an air fryer, Canstar Blue has surveyed more than 300 Aussie consumers to learn about the air fryers they’ve recently bought and used. The idea is to give you as much information as possible about the compared brands, to help you make a better-informed purchase decision. Brands were rated on a number of factors, including performance, value for money, design, ease of use and cleaning, plus functions and features. In our inaugural air fryer review, Philips took out top spot with a five-star rating for overall satisfaction, as well as most other variables. Kmart and Tefal received four stars for overall satisfaction, while Kambrook was left with three stars overall. Kmart was certainly the ‘best of the rest’ after scoring five stars for value, as well as ease of cleaning – the only brand to do so. Read on as we explore what each of the four brands in our air fryers review has to offer. When people think air fryers, they tend to think of Philips, and it’s easy to see why. Its designs are all sleek looking with easy to use displays. One of the more expensive Philips air fryers in the range is the HD9240-90 (pictured), which will set you back $469 RRP. The main advantage of this model is its large 1.2kg cooking capacity, allowing you to feed up to five people in one go. It also has a digital screen for easier control of time and temperature. 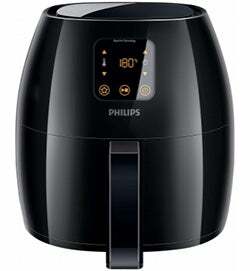 The cheapest air fryer from Philips is the HD99218-51 Daily Collection model, which costs much less at $229 RRP. It still has a larger-than average-capacity of 0.8kg, albeit smaller than the one above, despite having larger dimensions. It’s a high-powered machine that allows you to fry, grill, roast and bake all in one. The rest of the Philips range comes within the price range of $229 to $499. They all have in common a generally large capacity size, dishwasher safe parts, multiple different options for cooking, and easy to use controls. This year’s winner, Philips got five stars in most research categories, including overall satisfaction. It received three stars on ease of cleaning. Budget-orientated retail chain Kmart offers just one air fryer model for a low $69. 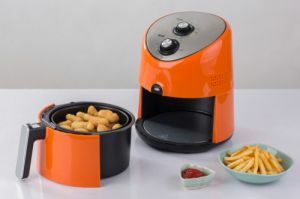 Kmart’s 1500W air fryer offers 3.2L capacity to prepare delicious and crispy fries and nuggets for the whole family. With seven pre-set functions and adjustable temperatures up to 200 degrees, it’s versatile enough to prepare even scones and scrambled eggs, perfect for your morning brekky. Its design features an LED control panel, a removable drying basket, and operation light indicator. For safety, you’ll find this model equipped with overheat protection and 30-minute automatic shut off. It also comes with a trendy black finish. It’s stated to be tested to applicable Australian electrical safety standards, being certified as compliant. Kmart got four stars overall, as well as for cooking performance, design, ease of use, plus functions & features. It got an outstanding five stars on value for money and ease of cleaning. 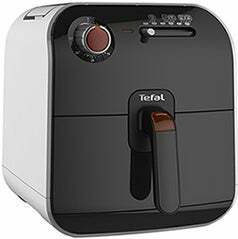 Tefal is known as a premium brand of household appliances, such as clothes irons, and also has an air fryer on offer. 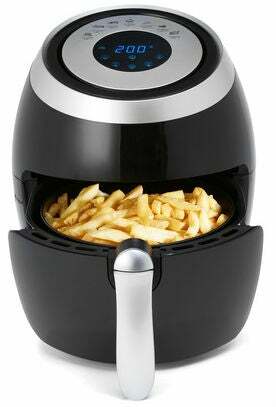 Its air fryer is the Tefal FX1000 Fry Delight, which will cost you $230 RRP. It features Air pulse technology stated to cook crispy fried food with little to no oil. It’s boasted to not only fry but also grill, roast and bake your favourite treats. It has a trendy design, with dishwasher safe parts for easy cleaning. It has a 0.8kg capacity to serve up approximately four servings of chips, and like with other brands, it has a handy timer for convenience. Expect a temperature range from 150 to 200 degrees and a cool to touch system for safety. Tefal got four stars for overall satisfaction, as well as all other categories, making it a solid performer in 2019. 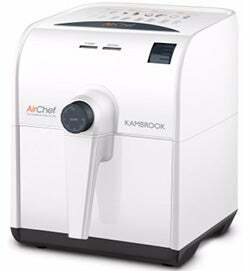 Kambrook has just one air fryer available at the time of writing, the KAF200WHT Air Chef. The Air Chef costs $179.95 RRP, making it considerably cheaper than most other brands. The most notable aspect of the Air Chef is the massive capacity – it can cook up to 2.5 kilos worth of food in just one session. This is despite having very similar dimensions to most other models. However, it’s less powerful than some. It also doesn’t specify if it comes with a food separator, which allows you to cook different things at once. However, if money is an issue for you and space isn’t, and you want to cook larger quantities of food in one go, then the Kambrook Air Chef could be an option for you. Kambrook received three stars for overall customer satisfaction and for all other variables. ALDI has also featured an air fryer amongst its Special Buys. 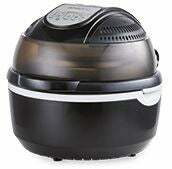 ALDI’s air fryer comes with 10L of cooking capacity and 1300W of heating power. It features an LED display with a digital control panel, plus a double layer viewing window. It’s claimed to have a Halogen infrared heating system and a 360 degree rotation system to cook food evenly. It also has a 60 minutes adjustable timer and adjustable temperature control of up to 230 degrees. You can choose from six different cooking programs. Accessories include a grill pan, rolling cage, tongs, dual rack, skewer rack, rotisserie spindle and forks. In addition, there’s a lid lock for safety. It comes with a three year warranty and has two colour variants – black or white. 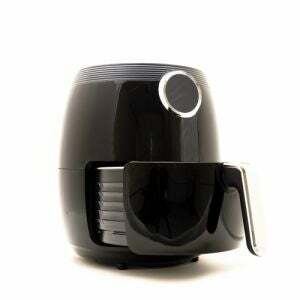 Air fryers are kitchen appliances that cook food by circulating hot air around it. They’re a relatively new appliance in the kitchen world that provide healthy and tasty foods cooked with less oil. Essentially, they look like tiny ovens or large rice cookers, and they have a chunky tray which can be removed, filled with food, and put back inside. The basic principle of air fryers is that they use circulated hot hair to heat up your food. They use rapid air technology to cook any type of food that you would otherwise cook in deep fat, such as chips and chicken. This rapid air technology circulates the air to temperatures up to 200 degrees, and the cooking chamber (where you store the food) keeps the food close to the heating elements, allowing your food to be cooked in 10 to 20 minutes without the need to be ore-heated. Above the cooking chamber is an exhaust fan, which helps provide the necessary airflow to ensure that every part of the food receives the same heating temperature required to make it nice and crispy brown. In addition, the air fryer comes with an internal cooling system that keeps the inside of the machine clean. This cooling system includes a fan mounted on the motor axis that controls the internal temperature and make sure that fresh air passes through the filters. Basically, the air fryer is extremely easy to use, and requires little to no maintenance on your part. In addition to making the process of frying easier, it also results in healthier and (arguably) tastier results due to the lower oil count. Pretty much any frozen food that you would put in an oven can be cooked in the hot air of an air fryer. 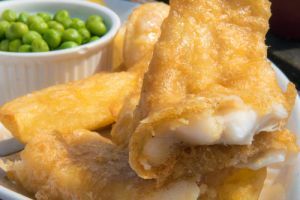 The most common one is chips – this is what a lot of people basically assume they are made for – but you can also do snacks such as chicken nuggets, fish sticks and potato gems, all of which are staples of households in Australia, particularly if you’ve got children. Cooking times vary depending on the food, but they tend to take around 10 minutes a lot of the time, and in some cases, can even be done in as little as six minutes with appropriate pre-heating! This is very impressive, and much faster than what an oven would take. Certain air fryers come with accessories such as a baking cage or grill pan that enable you to prepare meats in your air fryer. 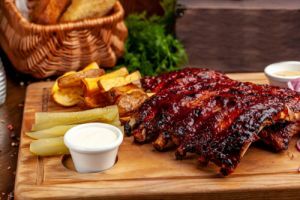 A whole roast chicken can be done in about 30 minutes, and roast pork and BBQ ribs can apparently be done in as little as 10 minutes. Other popular meats that can be cooked in an air fryer include burger patties, steaks and lamb chops. You can also roast certain types of vegetables in an air fryer, if they are the kind you would normally grill. Common meal veggies like capsicum and cauliflower can be grilled in the machine. Certain models come with a round ceramic bowl with a stir paddle that allows you to fry green vegetables just like you would in a skillet. Other veggies you can cook in an air fryer include peppers, corn, zucchini, kale and asparagus. You also have the option to cook non-stick baking dishes in your air fryer, which can be very useful for baking small items like cupcakes, bread, muffins and lasagnes. Essentially, you can cook anything in an air fryer that comes with a liquid or sauce, such as casseroles and curries. Muffins and cupcakes can be made in as little as 10 minutes. If you plan on doing baking with your air fryer, then be sure to get one that comes with a baking dish. If you’re a nut kind of person, then you’ll be glad to know that roasting peanuts, almonds and any other type of nut can be done very easily with your air fryer. 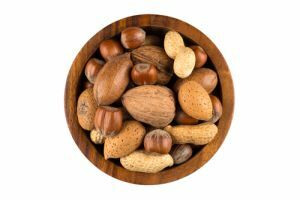 Peanuts and almonds can be done in 10 minutes, whereas walnuts will be ready to go in less than 8 minutes. What can’t you cook in air fryers? Despite their many uses, there are still a lot of foods and snacks that you shouldn’t put in an air fryer. 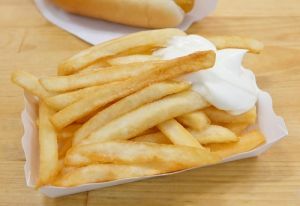 Batter-coated food is generally not suited for air frying, since the fast-moving air can push away the wet batter from the food and spray it all over the place. So, if you want to make battered fish or chicken, it is probably best to stick to the traditional methods of cooking. However, some have had success by frying the batter-coated pieces in a pan first and then frying them in the hot air fryer, but this takes longer and is really quite unnecessary. 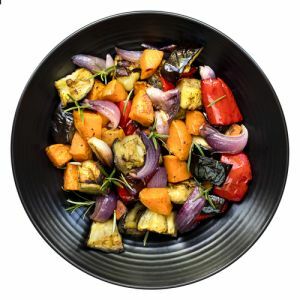 As mentioned before, vegetables that can be roasted or grilled can be cooked in an air fryer. However, you should avoid any kinds of vegetables that are usually steamed, such as carrots and beans. Since their primary function is frying, it goes without saying that foods you generally boil – mainly pasta and rice – are not suitable for use in an air fryer. For these, the old-fashioned way of boiling water is still best. Alternatively, you can get a rice cooker. Really, you can cook the majority of common foods in an air fryer if the quantity is not too big. Most air fryers come with a 500g capacity, but there are options out there with larger capacities. Air fryers open the door to innovation in cooking, and with a bit of experimentation, you can cook pretty much anything in less than half an hour. What to consider when buying an air fryer? Cooking performance is key, followed by value for money. It’s important that an air fryer does what it says it can, otherwise it will just be a waste of time. In addition, our survey found that Aussie households spend an average of $162 on new air fryers, which steers towards the middle of the price spectrum. Philips is the more experienced and established brand when it comes to air fryers, emphasised by the sheer number of models and additional features its units come with. Philips’ air fryers might be more expensive on average, but if you want proven frying quality, then our ratings suggest you’ll be in good hands. On the other hand, Kambrook and Tefal also have some quality air fryers. The Tefal Fry Delight sits towards the higher end of the price spectrum, while the Kambrook Air Chef is the cheapest after Kmart, which offers a budget-friendly option. Making healthy, low-fat and tasty food in a matter of minutes sounds like a dream, but try to do a little research before diving into the deep end with a new air fryer. Consider how often you’ll use it, and what you’ll actually use it for. The last thing you want to do is spend $200 on a new kitchen appliance that just ends up gathering dust. Canstar Blue surveyed 3,000 Australian adults across a range of categories to measure and track customer satisfaction, via ISO 26362 accredited research panels managed by Qualtrics. The outcomes reported are the results from customers within the survey group who have purchased and used a new air fryer in the last 5 years – in this case, 327 people.